Winter at the beach in Los Angeles doesn't quite evoke the need for warm fireplaces when you sit in the shadow of palm trees, but in the evening the temperature drops in Venice and hearty winter fare comes to mind. Perhaps something like the goose pâté served with warm toast and huckleberries pictured above? Chef Brendan Collins of Waterloo and City has brought his love for charcuterie to Larry's and the terrines and pâtés have traveled well from Culver City to the Venice boardwalk. 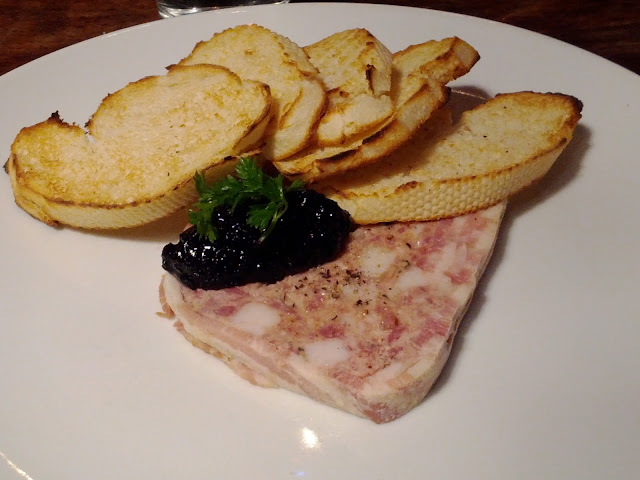 The dish is simple with the sugar and acid of the huckleberries cutting the rich fattiness of the pâté. Spread some on the warm toast and you are in business. Best of all, this dish is included in the Dine LA Restaurant Week menu, so if you get to Larry's soon, you get an even better deal.